Individual cron tasks are managed by the Jomres Pseudocron functionality. 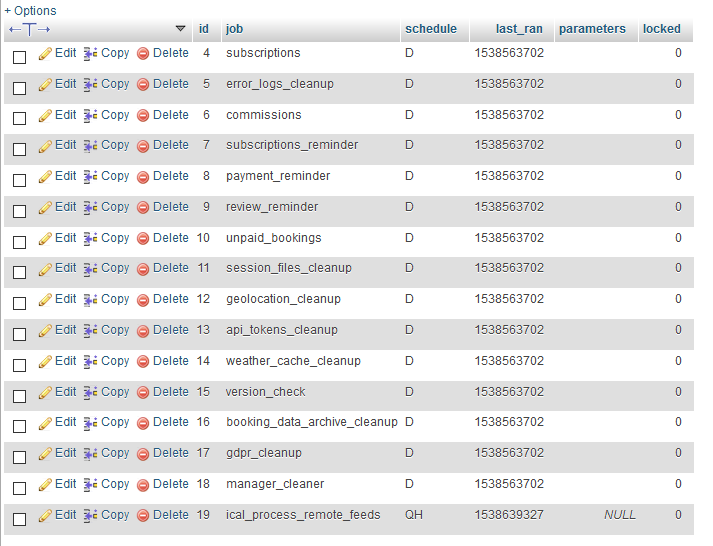 This functionality manages task schedules and decides which cron tasks should be called. These tasks are stored in the q43qy_jomcomp_cron table, who's contents will look like this. You can view the tasks via the Administrator > Jomres > Settings > Site Configuration page, Cron tab. On this page you will see a "Method" setting, which determines how the cron process is triggered. If it's left to the default setting of Minicomponent, then whenever Jomres itself is viewed in the CMS, then a background task is fired to asynchronously call the Jomres Cron functionality. This ensures that the actual Jomres task being called is not slowed down by the background tasks that are run, however it means that if your Jomres page isn't called for some time, for example an hour, then tasks that need to be performed more often, say every quarter hour, are not run at that time. To resolve that, you setup cron jobs to either call the Jomres Cron functionality, or you can call individual tasks as cron jobs. An example of how to setup a cron task to call Jomres is given next to the setting. On that tab, if you scroll down, you will see the jobs from the database. These jobs are presented as links, and if you click on one of those links, the scheduled task will be run. There is no output presented on the page, instead it will open in a new tab then a blank screen is shown. The purpose of this page is to give the Jomres plugin developer a brief overview of how to install and create pseudocron jobs for Jomres. Jomres supports a pseudo cron system, IE a system that works a bit like timed jobs in linux (cron). Cron jobs are called on a timed basis depending on how the cron job was installed (this cannot be changed at a later time, except by manually editing a table). As a plugin developer, you will want to tell Jomres that there are scripts you want to call on a timed basis. You do this in the plugin_install.php of your plugin. An example can be seen on the Creating plugins page. This functionality "registers" the cron job with the pseudocron functionality, and the intervals are as follows. A cron job file is just like any other 06000 task, ie it can be called by anybody, assuming that the menu linking to Jomres allows unregistered users to view it. That's it. It's very simple. Create a 06000 task that "does stuff", then use ''addJob'' in ''plugin_install.php'' to tell Jomres to call it from time to time.